A couple of weeks ago we dragged our tent out of hibernation and headed over to Pembrokeshire for a weekend of relaxation. Of course the word relaxation means different things to different people but for us it involved two days of walking and exploration. From our base on a small farm near Brandy Brook we were well positioned for the coastal path and spent Saturday along a new section (for us) between Solva and Pointz Castle. The scenery was its usual stunning and varied self but dull and overcast conditions meant the camera remained largely unused. That's not to say there wasn't plenty of wildlife about however with a couple of Choughs and a family of four Peregrine Falcons both putting on superb flight displays along the cliffs. Come Sunday it was all change again with blazing sunshine and warm winds returning. 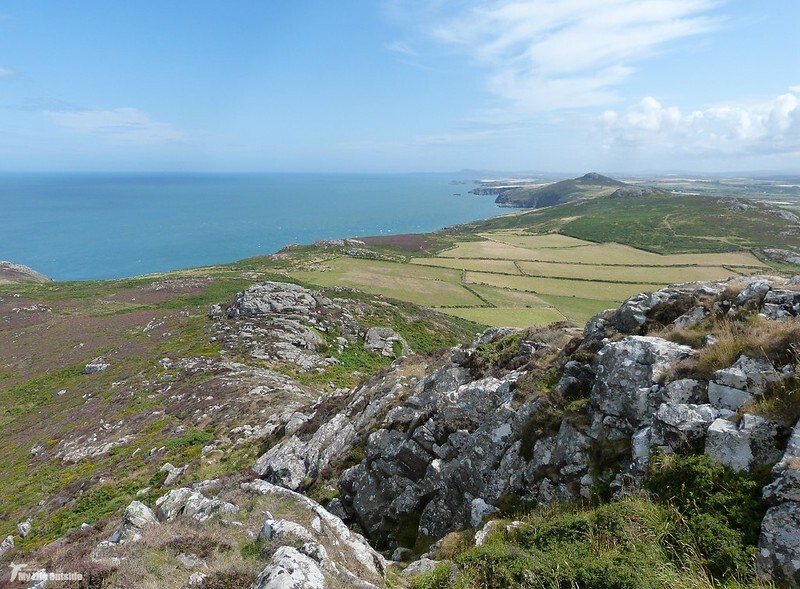 Having checked the map we decided on a visit to St David's Head where a previously un-bagged trig point atop Carn Llidi seemed a worthy target for the day. Last time we were out this way we somehow managed to circumnavigate the entire hillside but never actually made it to the top. Definitely an omission in need of correction. 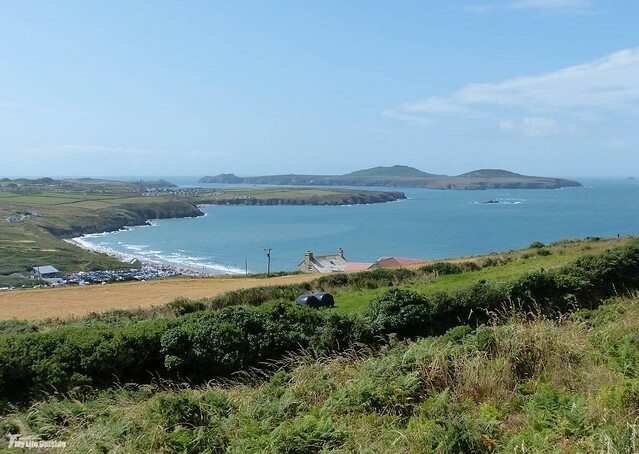 Driving down the narrow lane to Whitesands Bay it was clear that plenty of other people had had similar thoughts to our own and we unsurprisingly found the main car park fit to burst. Retreating little more than a mile back the way we'd come however delivered a completely empty field with prices less than half what they were down the hill. Result. 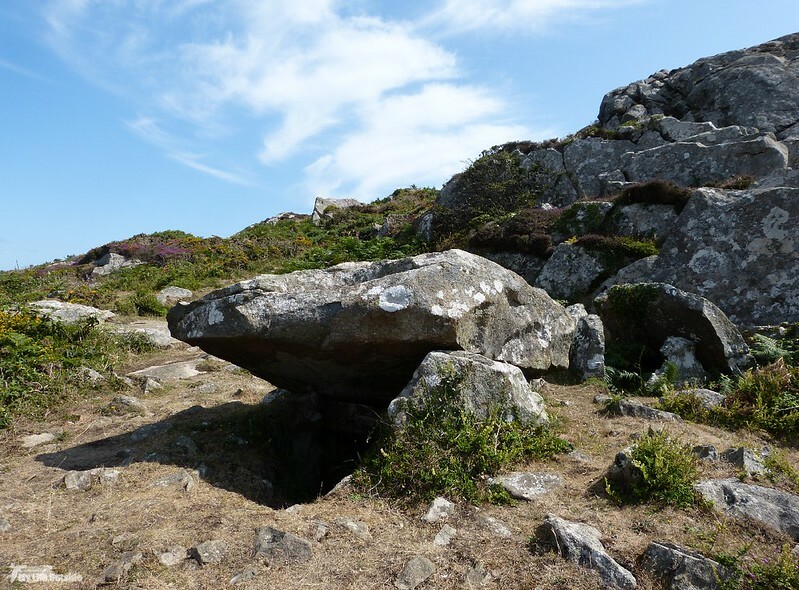 Our changed starting position even meant easier access onto the lower slopes of Carn Llidi where an old concrete track of WW2 origins led us upwards via an ancient burial mound of impressive proportions. Climbing further brought us to a plateau at Highwinds where there are still substantial remains of a Chain Home Extra Low radar station also dating from WW2. 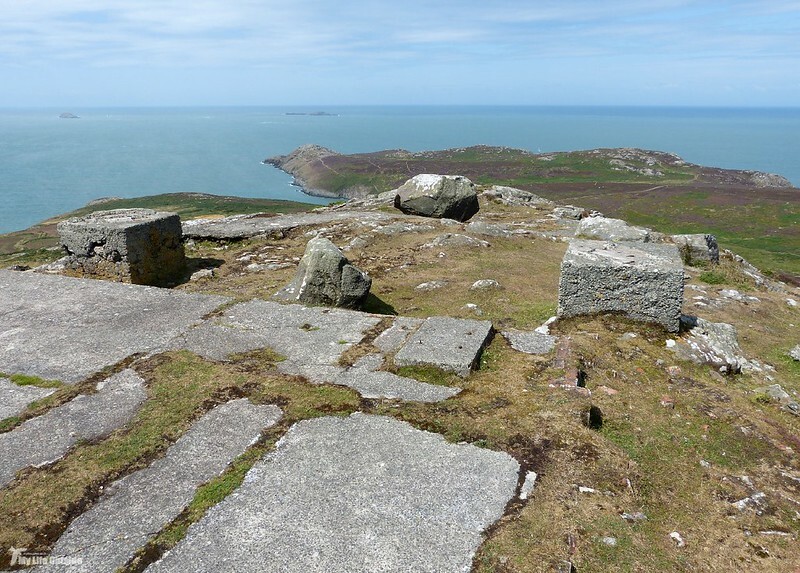 The large concrete blocks seen in the photo below served as bases for a radar gantry and just out of shot footings can still be seen for a machine gun emplacement. The views from up here would certainly have been commanding though more than a little exposed during adverse weather conditions. Moving onwards the previously well defined track peters out and it is left up to the individual to pick out a route across increasingly barren and rocky outcrops. A couple of locations necessitated the need for some hands down action which only added to the sense of achievement upon finally reaching the top. Here what had been a slight breeze at lower altitudes was now something a lot stronger but that didn't detract from the vista laid out before us. 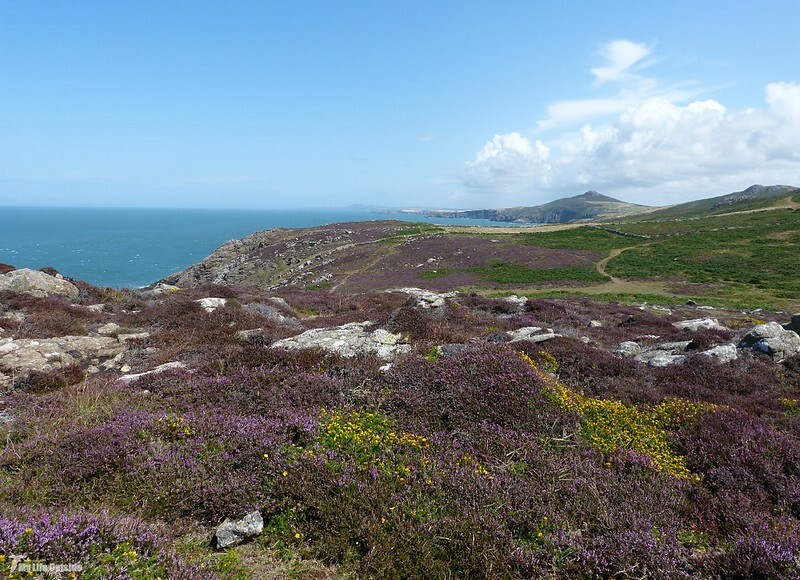 Mile upon mile of the Pembrokeshire coast was on display and with it a varied mix of colours from the blue of the sea to the yellow and purple of Gorse and Heather respectively. All of this couldn't cover the fact however that the trig point for which we were aiming seemed rather conspicuous by its absence. Tall concrete columns aren't usually that hard to disguise so where on earth could this one be? A thorough search of the top revealed nothing more than a couple of twisted metal bolts which were presumably more remnants of military occupation. 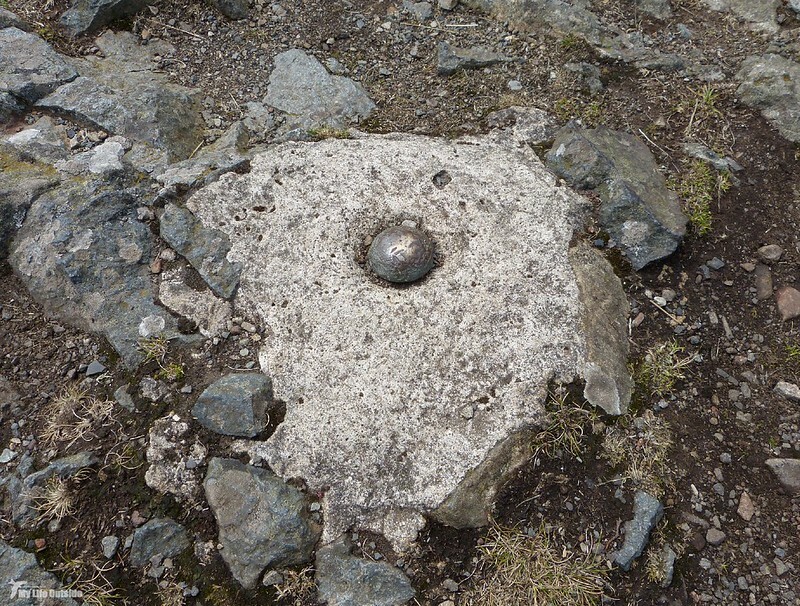 It wasn't until Emma pointed at my feet that I realised I was standing right on top of our quarry, though it wasn't a trig point as indicated by the map but instead a large brass bolt! Far less impressive but nice to locate nevertheless. Our descent took us down the northern flank before we stopped for lunch near Dar y Cadno. Here we were treated to the sight of at least twenty Gannets fishing close in to shore but even better was lurking just beneath the surface. A tell-tale splash heralded the arrival of at least three Porpoise who spent the next ten minutes or so playing in the waves, surfing and breaching regularly. Such was the clarity of the water that we were even able to watch them swimming when fully submerged. Pretty magical by anyone's standard and so engrossing that it never occurred to me to take any video. Doh! Instead you'll have to make do with the surrounding scenery instead. Suitably refreshed we headed back East and out onto St David's Head proper. The ancient fortifications built at its terminus are still mightily impressive and this time had the added bonus of a Sparrowhawk attempting to benefit from large flocks of Linnet in the area. The hunt we witnessed proved unsuccessful but it wasn't long before the whole lot was back in the air. A pair of Chough also popped in briefly though we didn't manage the same crippling views as during our first visit here several years ago. To be honest I'm surprised we saw them at all such were the volumes of people along this particular stretch of coast and who can blame them for turning out on such a gorgeous day.